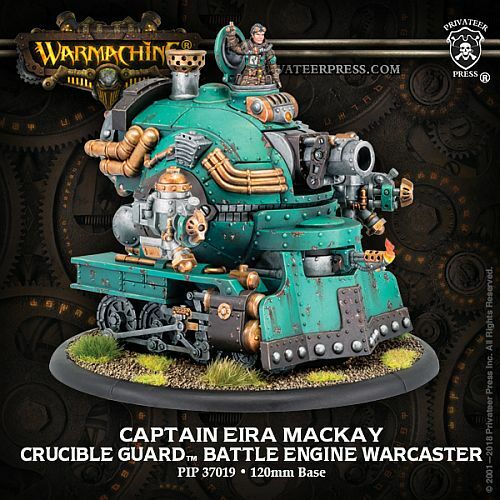 Seeing a need for those with her warcaster abilities, Eira Mackay joined the Crucible Guard as soon as she was able, eager to assist in the war effort against those she saw as cruel oppressors. Life on the front lines was too dangerous for her father to bear, so he turned his talents into creating a bulwark to shield his daughter from harm: the Railless Interceptor, a unique weapons platform akin to the war wagons and gun carriages of the past, cross-bred with a locomotive and blended with alchemical and technical innovations. Traditional Crucible Guard commanders view the weapon as a novelty, but Captain Mackay works to prove their assumptions wrong, and she seems born for the task. Kjøp Crucible Guard: Captain Eira Mackay - Battle Engine/Warcaster (1) - PIP-37019 her på Kelz0r.dk // Hacknslash alltid et stort utvalg med lave priser!